There's no doubt that easy access to a sunny beach is the reason why the Sunshine State is so popular. There's a beach no further than 65 miles away from any city. While you can find a strip of sand most anywhere along the coast, every beach does tend to have its own personality. Historic Amelia Island and Fernandina Beach, 30 minutes northeast of Jacksonville, is home of Little Talbot Island, one of the most secluded and unspoiled sand-dune-covered beaches in the state. This five-mile-long barrier island displays the signs of natural plant succession and growth from pioneering grasses on the dunes to sea oats to the gnarled, picturesque live oaks on the older dunes. Amelia Island is the only public beach in Florida where you can ride a horse for miles, often through desolate stretches. A canopy of centuries-old oaks backdrop the untraveled dunes where nature has not been replaced by sky scrapers. Interestingly, Amelia Island's scenic beaches are actually made up of finely-ground quartz from the Appalachian Mountains. For centuries, the bits and pieces have washed from the eroding mountains into the sea and onto the beaches of Amelia. Several five-star resorts in the area continue the natural motive that "mother nature" so thoughtfully instilled. Despite its location between Daytona and Orlando, Cocoa Beach is still a true 1960's Florida town. A mixture of "surf bums" and "astronauts" is evident in the names of streets and businesses. The area retains its reputation as a surfing capital of the world, and locals and visitors flock to the region all year long in search of the perfect wave. The beach-side environment, with service-oriented stores and even the largest surf shop on the east coast, reflects the focus of the beach activity. Surfing combines with space age technology at the Kennedy Space Center; that portion of the beach is closed during shuttle launches, and a national wildlife sanctuary is left pretty much as it was in the 18th century. In the summer, sea turtle eggs hatch on that beach and wildlife experts take visitors on a wildlife trail to watch the interesting event. West Palm Beach is a showcase of old money, aristocracy and luxury yachts. Fishing and diving enthusiasts may find this a convenient location to plan some excursions to the deep, as West Palm is the closest shoreline point to the Gulf Stream in the Atlantic Ocean. The beach itself is one that you may not want to miss, where million dollar homes and yachts are frequent sights. Unfortunately, the beach there has dwindled over the years. 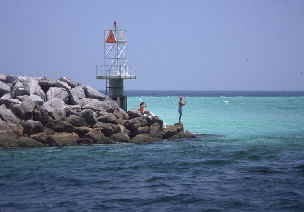 The bordering jetties, rock barriers and sea walls that were built to stabilize the shoreline of West Palm Beach have actually contributed to the beach's erosion. Part of that is evident off The Breakers, one of the oldest and most exclusive of hotels in Palm Beach. Much of the sand in this area has been trucked in and deposited in an effort to keep the beachfront healthy. Miami Beach continues holding its own with wide expansive beaches next to some of Florida's most historic hotels. The revitalized Art Deco district is a hotbed of nightclubs and hotels at night, and in the daytime offers interesting decor and a peaceful, tranquil beach. Beachside activity and larger crowds can be found on north Miami Beach. Several hotels have constructed huge boardwalks which allow beachgoers and visitors easy access to the sand while protecting the dunes and sea oats. Weekend barbeques and beach parties are often scheduled by the major hotels. The recent expansion of the beach and re-planting of trees and sea oats has beautified the shore, while at the same time has provided a base for the continued existence of this heavily constructed barrier island. Sanibel/Captiva is the place to go for those who want to be part of the "Sanibel stoop" - bending down to collect beautiful and sometimes rare sea shells. While there, beachgoers are treated to one of the most secluded areas on the central west coast. Captiva, the story goes, got its name because the pirate Jose Gasparilla kept his female captives on the island. Now, the excellent year round weather, the beautiful shells that wash ashore, the wildlife and the scenery capture most visitors' attention. 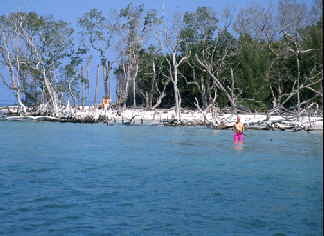 The island beaches can be toured with a car, on bicycle, or along the backside of the mile-wide island by canoe on a trail that traverses the mangroves. Many small to mid-size hotels are located on the island, which carefully balances its image as a remote barrier island and a modern resort destination. 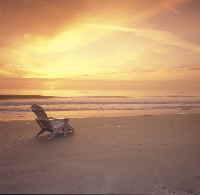 St. Petersburg Beach offers some of the largest camping and beachfront areas in West Central Florida. Perhaps one of the least known areas there is the beach at Fort De Soto State Park. The park, at the southernmost tip of St. Petersburg, spreads over five islands and also offers fishing, picnic grounds, bicycling, boat ramps and more than seven miles of beachfront. There are no hotels on the site, but a restaurant is open most of the year. For those who seek a little more accessible beach, Pass-a-Grille is the ticket. This small beach borders what is likely the last small beachfront community in the area. Beachfront bars and winter homes face a wide, expansive beach where volleyball games are often planned on the spur of the moment. Pensacola, billed as the World's Most Beautiful Beach, describes quiet, powdery-white sand dunes and sea oats where you can sometimes walk a mile without seeing another human being. This is part of the Gulf Islands National Seashore, which stretches 150 miles westward from Pensacola to Gulfport, Mississippi. Many claim this is where the whitest sands in the world can be found. Beachside country music mingles with small attractions in this area of the state, nicknamed "redneck riviera." You can fly the beach on a helicopter, surf the normally gentle Gulf waves, or go sailing right off the beach. Or rent a dune buggy and take it for a spin. Summer tourists from nearby states come to enjoy the sun and surf fishing. In the winter, as you explore most of the trails, you can almost pretend you're the first (or last) inhabitant on the earth. Daytona Beach, billed as the "World's Most Famous Beach," earned its reputation as the grounds for the country's first land speed records in the early 1900's. Today, visitors can still drive on many parts of the hard-packed beach for several miles, but only during daylight hours and no faster than 10 miles per hour. Daytona is also synonymous with spring break (March and April) and there are many adults now whose return to this area brings back memories. Each year, more amusement centers, bars and discos appear on the extensive boardwalk where everyone hangs out. Just before the spring crowds arrive, surfing is the chief pastime. Florida's version of "hanging ten" happens mostly in the winter months when the cold fronts create wind -blown seas. If these conditions also happen in the summer, it's due to an approaching hurricane so chances are you don't want to be there at that time.